French manufacturer of funky round speakers of excellent sonic performance. Planet L, Planet M and Planet Sub speakers combine high-end design and meticulous aesthetics. As the result of 2 years of R&D efforts, Elipson has retained the best acoustic technologies for uncompromising sound reproduction. Both Planet L and Planet M speakers are fitted with a coaxial 2-way speaker that make the perfect mix of high fidelity, elegance and design. The Planet Sub incorporates a 200W Class D amplifier to anchor your surround sound music system. The Planet range is designed to fit with your lifestyle. With a choice of three high gloss lacquered finishes (black, red or white) you can match the Planet speakers to your home decor or taste. Planet L and M speakers allow you to wall or ceiling mount your speakers, or use a traditional floor stand - whichever option maximises your listening pleasure. The little sister of the Prestige Facet range has been equipped with an integrated amplifier to connect to today's world. With the PF6B BT, Elipson has created what it calls Connected High-Fidelity. With a true stereo sound broadcast through high-quality speakers, streaming enthusiasts will rediscover the world's most well-loved tracks. The Prestige Facet 6B BT allow the Facet family to count itself among a new generation of connected speakers. Standing at the crossroads of high fidelity and connected speakers, this model offers the best of both worlds. From the hi-fi universe, it inherits its precise and extremely musical sound, all while offering wireless connectivity and compatibility with any Bluetooth device. Paintable magnetic square grid for Elipson In IC6 and IC6ST speakers. Paintable magnetic square grid for Elipson In IC4 speaker. The In range consists of 4 in-ceiling models and 2 in-wall models. Available in different sizes, they allow you to create a complete and effective sound environment, whether in a public space or a private home-theater room. With their magnetic ready to paint grid, these speakers will fit discreetly into any space, and their rotating tweeter allows multi-directional positioning to ensure optimal diffusion of sound. The In range consists of 4 in-ceiling models and 2 in-wall models. Available in different sizes, they allow you to create a complete and effective sound environment, whether in a public space or a private home-theater room. With their magnetic ready to paint grid, these speakers will fit discreetly into any space, and their rotating tweeter allows multi-directional positioning to ensure optimal diffusion of sound. Optional square grids are also available for inceiling models. Since its launch in 1975, the Prestige line has enjoyed immediate success among audiophiles, thanks to its neutrality and its fidelity, combined with heightened sensitivity. 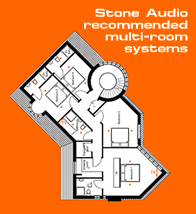 This design gives free reign to all your applications, as well as in hi-fi or in home-theatre, and makes you enjoy an exceptional sound experience.